Research scientist Richard Grosshans is counting on cattails to help clean up Lake Winnipeg and Manitoba's wetlands, while also offering an organic, sustainable source of biofuel. He's one of over 100 Manitobans nominated as part of CBC's #IamMB storytelling project. 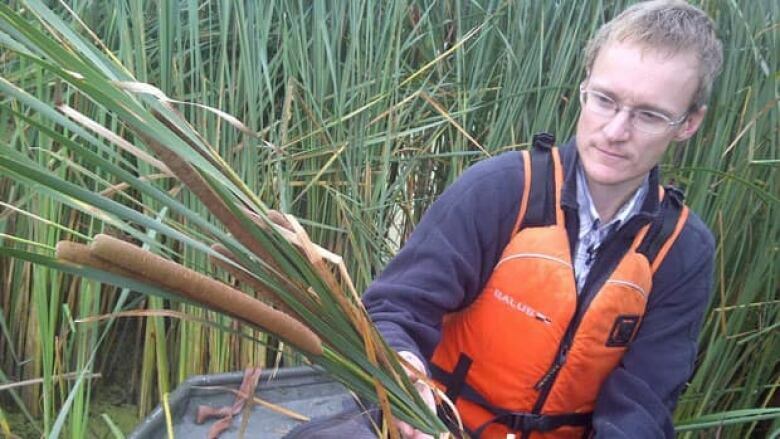 Research scientist Richard Grosshans is counting on cattails to help clean up Lake Winnipeg and Manitoba's wetlands, while also offering an organic, sustainable source of biofuel. "It is extremely efficient at absorbing things like nutrients, like phosphorus or nitrogen, or even contaminants. And so we use this plant, we harvested it, to remove those things from the environment," he said. "By harvesting and management, we're rejuvenating and restoring the wetland habitat for other water birds." Grosshans is among over 100 Manitobans nominated by their peers, friends and families for CBC's #IamMB project, which is sharing the stories of people who have shaped our province's past, lead us in the present or will create our future. Grosshans, who is the bioeconomy lead with the International Institute for Sustainable Development's water program, was nominated for his "dedication to research and innovation to develop new renewable energy sources from Manitoba's natural resources, while safeguarding the future of Lake Winnipeg." He and other researchers want to remove phosphorus from Lake Winnipeg and other freshwater bodies because it contributes to that greenish sludgy stuff that not only looks unappealing, but is also harmful to the aquatic environment. "Phosphorus, you may have heard, is what's causing these algae blooms in Lake Winnipeg, so we want to try and remove that stuff from the environment," he said. So what happens to all those cattails after they're harvested out of the lakes and wetlands? Grosshans said they are put to good use. "We take that plant material — it's called biomass — and we can convert it to stuff like fuel pellets for energy or other bioproducts," he said. "It's removing the phosphorus from the environment and it's creating a valuable product that we can offset the use of coal and other fossil fuels to create sustainable energy. So it makes a difference." Grosshans's research has contributed to energy and environmental policies internationally. It has also earned numerous honours, including making the Sustania 100 list of global sustainable development solutions in 2012. The work has been undertaken at various natural and human-made wetlands, including the Netley-Libau Marsh at the south end of Lake Winnipeg and the Pelly's Lake water retention project near Holland, Man. But Grosshans said he can see wetland plants being harvested in a variety of watersheds — even ditches. "The drainage ditches along all our highways are growing with all kinds of plants like this, and they're all actively taking things out of the environment," he said. "So by better managing our watersheds, we can actually help improve the water quality. We can make life better for the animals and the people who use this area." Social Wall: How are you celebrating Canada on July 1?